Brass Astrolabe from Iran, ca. AD 1700, purchased in Aleppo, Syria, in 1920 (OIM A4091). Currently on display in the Special Exhibit "Silk Road and Indian Ocean Traders: Connecting China and the Middle East." 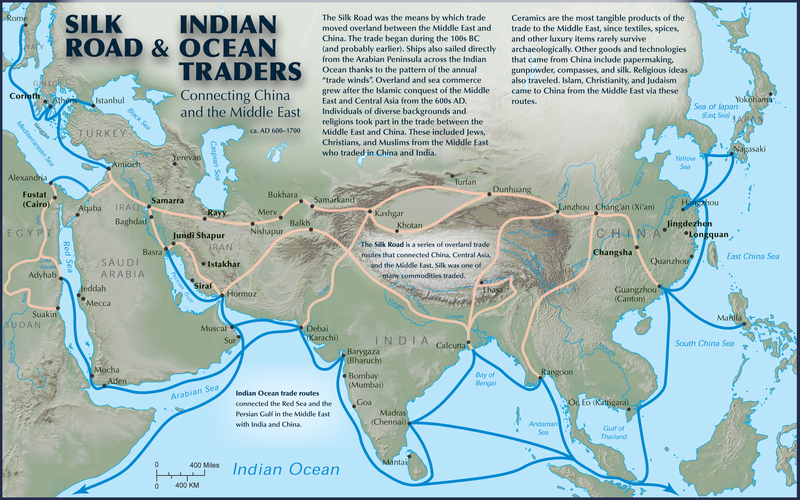 This mini exhibit uses the Oriental Institute’s collections to highlight trade connections over land and sea between China and the Middle East, primarily the Silk Road trade route and Indian Ocean maritime trade. Using Chinese ceramics found in archaeological excavations throughout the Middle East, this exhibit illustrates how Chinese inventions inspired craft traditions in the Middle East, particularly production of silk and paper. This mini-exhibit is guest-curated by Oriental Institute Research Associate Tasha Vorderstrasse. Join Dr. Vorderstrasse for a Lunchtime Traveler Series gallery talk in the Robert and Deborah Aliber Persian Gallery at the Oriental Institute Museum, Thursday May 1, 2014, 12.15–1.00 p.m. The talk will discuss the displayed objects and emphasize how Chinese inventions inspired craftspeople in the Middle East. Silk Road and Indian Ocean Traders is part of Envisioning China, a festival of art and culture presented by UChicago Arts. Learn more at envisioningchina.uchicago.edu. Astrolabes could be used on both land and sea to determine latitude using the height of the pole star and the sun, thereby helping to situate traders within their environment. This Persian astrolabe was made by 'Abd al-'Alī (probably 'Abd al-'Alī b. Muẖammad Rafi' al-Juz'ī) and decorated by famed astrolabe maker 'Abd al-A'imma. Although an astrolabe such as this one had a practical use for navigation, its lavish decoration marks it as an art object in its own right. Experience the Oriental Institute Museum’s 360° interactive virtual tour! View a large-scale PDF version of the map. Browse materials in the Oriental Institute Museum Collections and Archives.